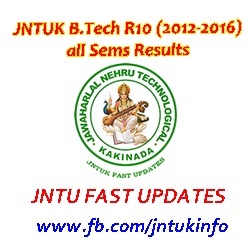 JNTUK B.Tech 2012-2016 Batch Results – R10 Regularion All Years and Semesters. Jntu kakinada R10 Regularion all sem results, jntuk all results, jntuk regular exam results and jntuk supplementary exam results. Many Students are asking please provide all semesters or years result links at one place with include supplementary exams. So JNTU FAST UPDATES team collected all Regular and supplementary Examination results links from different sources like jntukresults.edu.in, manabadi.com, schools9.com and jntuk.edu.in. JNTUK 1-1 Sem results, JNTUK 1-2 Sem results, JNTUK 2-1 Sem results, JNTUK 2-2 Sem results, JNTUK 3-1 Sem results, JNTUK 3-2 Sem results, JNTUK 4-1 Sem results, JNTUK 4-2 Sem results. Note : For Recounting/Revaluation/Challenge By Revaluation Results please contact respetive colleges. Here we are providing Regular/Supply Exam results only. Note: In case any links are not working, Please Feel Free To Leave Your Comments Below. JNTUK B.tech R10 1-1 Sem results, JNTUK B.tech R10 1-2 Sem results, JNTUK B.tech R10 2-1 Sem results, JNTUK B.tech R10 2-2 Sem results, JNTUK B.tech R10 3-1 Sem results, JNTUK B.tech R10 3-2 Sem results, JNTUK B.tech R10 4-1 Sem results, JNTUK B.tech R10 4-2 Sem results, jntuk regular results, jntuk supply results. Dear sir, 4-1 result regular link not working please provide link r10 regulation.